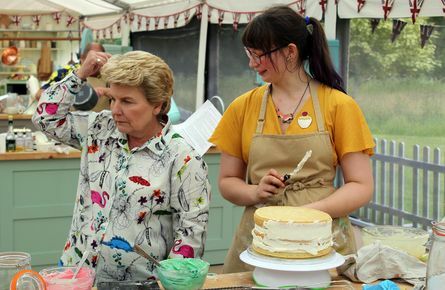 The Custard TV: Bake Off Breakdown: Vegan week causes a topple. 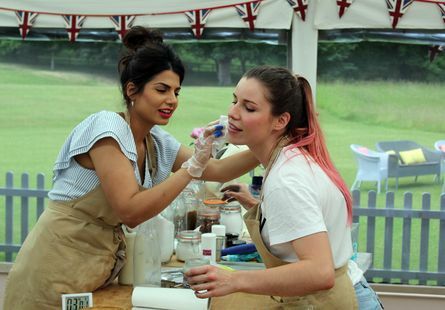 Bake Off Breakdown: Vegan week causes a topple. Hello again Bake Off lovers. What a turn up for the books it was this week as the bakers had to go butter and egg free in the first ever Vegan week. Now personally I would have no idea where to begin and to be honest neither did most of the bakers. Jon did not look happy right from the very beginning admitting he ate meat with everything. First up was a savoury pastry signature challenge where they couldn’t use eggs or butter. The bakers used a collection of avocado oil, coconut oil and vegetable shortening for their pastry along with tofu, vegetables and nutritional yeast for fillings. For their technical challenge, the bakers had to make a tropical fruit pavlova with no eggs! What was the secret ingredient? Chickpea juice apparently! Finally, the showstopper was a vegan celebration cake and this is where it all crumbled. Literally. Overall it felt like a real struggle of a week with no-one really doing their best baking. Rahul’s chickpea curry tarts were “poetry” according to Prue. Kim-Joy’s pastry was “amazing” and her balance of flavour got her a handshake. Rahul’s pavlova had “everything”. “Bravo”. Briony’s mocha cake was “very nice”. Kim-Joy’s fox cake looked great and was “a very nice cake”. Jon’s tarts looked awful and were virtually empty of filling. Ruby’s tarts were just bland. Jon’s cake looked “sad” and “crude” and was a bit “claggy”. Manon’s cake was “gluey” and “not a good cake at all”. Rahul’s cake was soggy with coconut drizzle and collapsed in on itself. Ruby’s cake completely caved in and collapsed. The top tier was bigger than the bottom! The flavours were good though. Noel walked about with a cake cover on his head like a spaceman. Sandi got blanked by Rahul – the poor lad was busy baking. Star baker: Kim-Joy. Well-deserved for her tarts and foxy cake. Who left the tent? : Jon. From the beginning, it looked like he really struggled this week with the lack of animal products. His cake decoration was terrible. Who’s for the chopping board next week? : Manon’s time must be coming to an end, along with Ruby, after the disasters of this week.